Located in Pune the educational Capital of India, Neville Wadia Institute of Management Studies and Research encourages and helps its students to imbibe in themselves this element of ‘genius’, by providing them best of facilities and management education. In doing so NWIMSR has always endeavored to mould its students into effective leaders who blend business practice into theory, ones who advance the evolution of strategies ideal for promoting a vibrant and throbbing business environment. 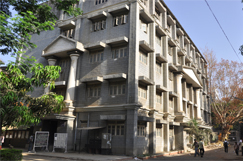 Neville Wadia Institute of Management Studies and Research was started by Modern Education Society in 1991. The institute is affiliated to the University of Pune and recognized by the All India Council of Technical Education (AICTE) and Government of Maharashtra. The above courses prepare the students for the plethora of experiences that they would face in real life situations in the corporate and entrepreneurial world. Each course is designed to cater to the requirements of the corporate world. It prepares them for the plethora of experiences that they would face in real life situations in the various industries.